The secret to finding a dog-friendly date, activity, or business is right in your hand (the one without the leash in it). Whether you’d like to meet a fellow dog lover, find fun activities to do with your dog, or plan a dog-friendly vacation, there’s an app for that. Sisters Leigh and Casey Isaacson of Newton consider meeting the dog just as important as meeting the parents. That’s why they created Dig, a dating app for dog lovers that tackles what Leigh Isaacson calls the “compatibility issue” head-on. “If you’re not a dog person, it’s a big adjustment [in a relationship],” she says. Users, who don’t have to own a dog, can create a profile combined with their dog’s, or without a dog at all. 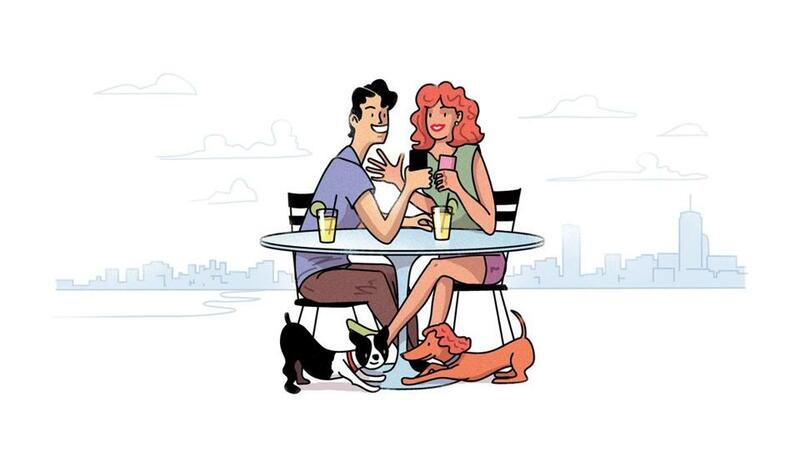 After making a match, the app suggests dog-friendly locations — for dates or solo excursions — and it notifies users of daily deals and tips from veterinarians and trainers. “Even though it’s a niche, it’s a big niche,” Isaacson says of the app. “People in Boston want more things to do with their dogs.” Dig also covers New York, New Orleans, Chicago, and Orlando. Bostonians have embraced BarkHappy, a social app that helps dog owners connect with one another and find outings they and their pets can enjoy, says founder Ninis Samuel. “Your dogs naturally want to be social,” he says. “This is helping you live your life with your dog and have experiences with your dog.” Besides listing more than 50,000 dog-friendly locations on its map of the United States, BarkHappy hosts a local monthly event — ranging from yappy hour to trivia night — that consistently sells out. “We never knew Boston would be so dog-loving,” Samuel said. “It’s one of the highest engaged cities we’ve got.” The app is also big in Austin, Seattle, and Chicago. Even better, BarkHappy donates a portion of event proceeds to nearby animal-welfare organizations (locally, Missing Dogs Massachusetts and PAWS New England). Inspiration struck Melissa Halliburton in 2005, when she wanted to bring her dog along to a wedding on Cape Cod and couldn’t find a pet-friendly hotel close by. The MIT grad soon created BringFido, a regularly updated directory of 250,000 pet-friendly hotels, restaurants, and attractions in 190 countries. Halliburton started by hiring 12 former classmates to help her call hotels around the United States so users of the site — which launched in 2006, followed by the app in 2011 — would have pet policies at their fingertips. “It just makes it easier to enjoy your life with your dog,” Halliburton says. “It makes the dog’s life better.” Hotel reservations made through BringFido come with a guarantee that pet fees are accurate, and the company offers 24/7 customer support.